painted them with Martha Stewart grey chalk paint. After they dried I rubbed a bit of white paint thinned with water over them, to give the letters that galvanized metal look. I love this!!! 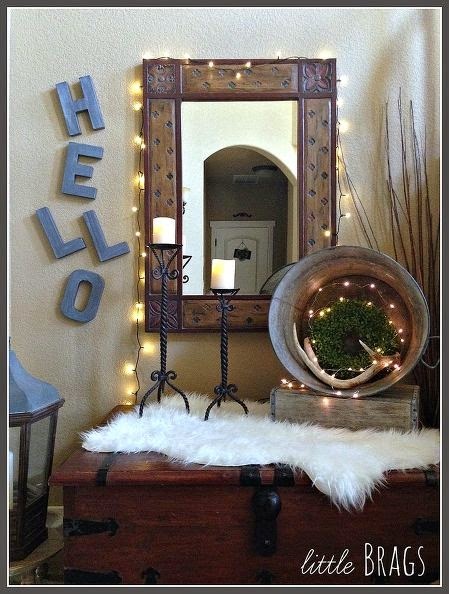 The Hello & the lights & wreath...PERFECT!!! Spectacular entry. 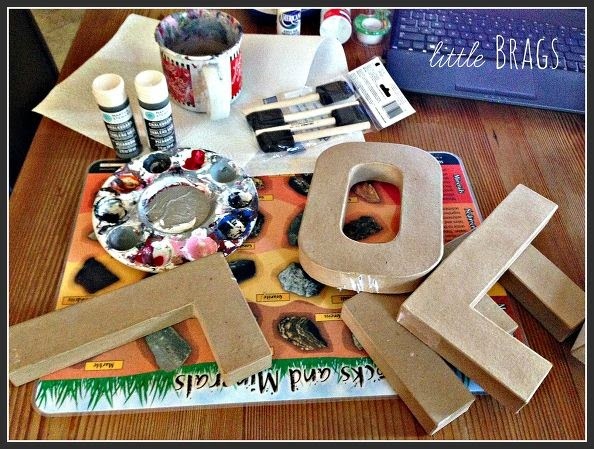 And I love how you made the cardboard letters look like old tin letters. I am pinning this right now. I came down with a mild obsession for those cardboard letters this past Christmas and even did a V for Valentine's Day. Can't wait to give this a try. Visiting from Mod Mix Monday. 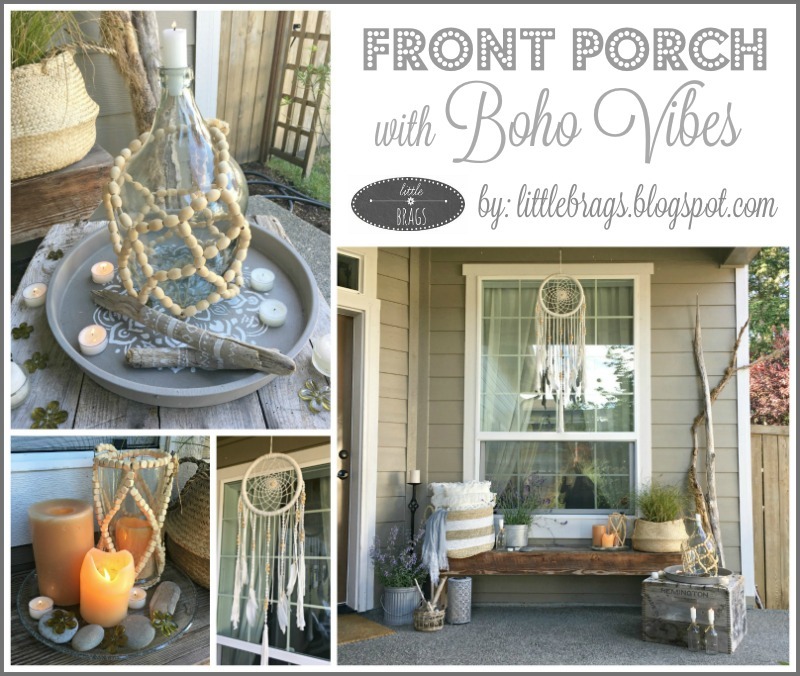 Love your new eclectic entry, it looks great! 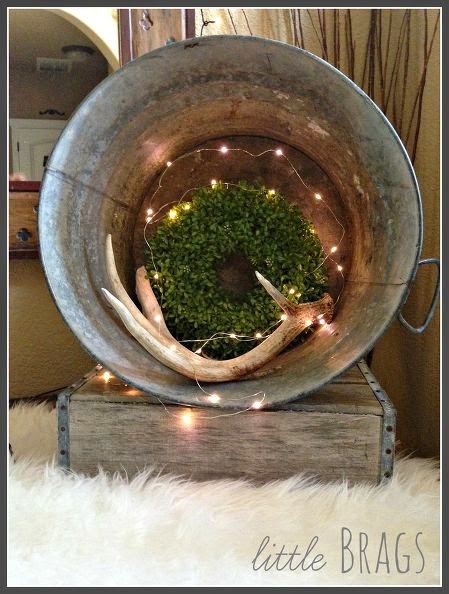 The idea of turning the old washtub on its side and putting a wreath inside is just pure genius! It has been beautiful here in Washington this whole weekend, I've gotten a lot done too... the garage is NOT one of them though and it needs to be organized so bad! Christine how creative. I love the hello letters those are pretty awesome. Your eclectic entry looks fabulous. I love your new entry! The "Hello" letters are perfect! I'm pinning this for future plans for my entry. I like it! I like how you turned that tub on it's side and filled it with the boxwood wreath. I also LOVE that huge lantern! I don't recall seeing that before. Is that new? 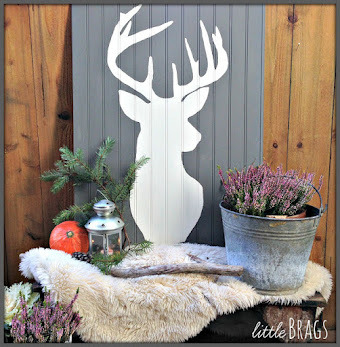 Love your entry decor...especially the galvanized tub! Thanks for sharing! The foyer is not only beautiful, it is also fun and makes you smile!!! Very fun and original! I like that bucket on its side with the lights and antlers! Very creative with the letters- they turned out great! Organizing makes you feel so much better and takes a weight off the shoulders! I love your entry. Fun textures and tons to catch your eye. Looking good! 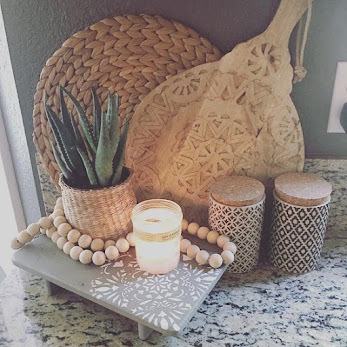 I love it, especially how you used the washtub! 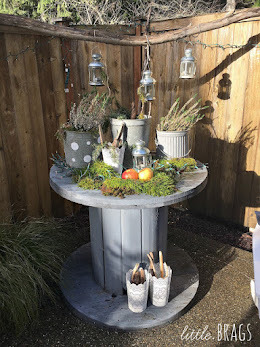 Love that vignette, perfect touches of rustic and industrial that blend together so well, nice grouping Christine! Beautiful entry, Especially the lights. So. Gorgeous! Love your style. That 'Hello' sign is completely genuis. You always rock the inspiration! Very nice--sharing on Facebook! Thanks for linking up! I really love the hello letters.. such a fun entry! I would of never thought those HELLO letters were cardboard! Great job. 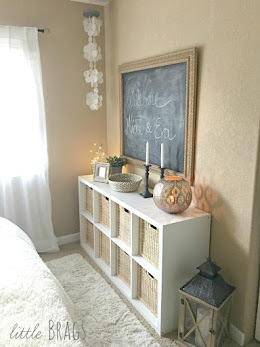 My entryway is on my LIST of future projects and this is def some inspiration and a kick in the pants to get re-motivated! Thanks for sharing at Share Your Cup Thursday! 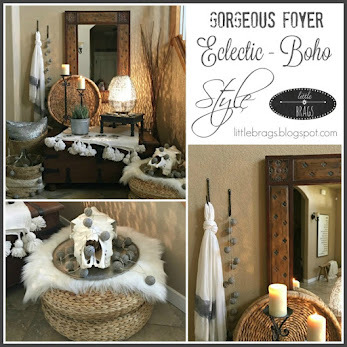 Eclectic is my kind of style! We were able to work on our garage the other day as well. Always feels nice. Thanks for sharing with SYC. Love it, and love that chest....it all says welcome so nicely! I love it! I wish I could decide what to do with my entryway. 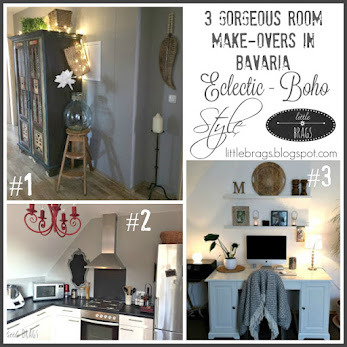 Love it eclectic and all! Thanx for joining THT. Love it so very much! The letters have got to be my favorite....I love how they are scattered (not sure if that's the word I am looking for) a little. Very unique and fun!! This is GREAT....so much personality and charm...love it....here from french country. Oh it's just fabulous Christine! So fun and eclectic and conversational. Love the charm of it all. What a great collection! I may have to "borrow" some of these ideas for my entry! It looks like we have the same layout! 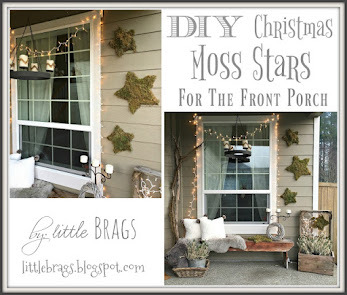 Thanks for the post- I found it on the Weekend Retreat Link Party! Christine, this is a fabulous collection, it turned out wonderful, the letters pop in the blue!!! 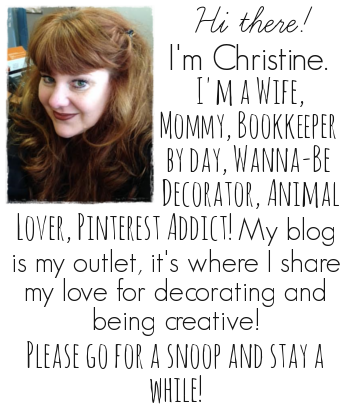 Thanks for taking time to share on The Oh My Heartsie Girl Friday Features this week!! 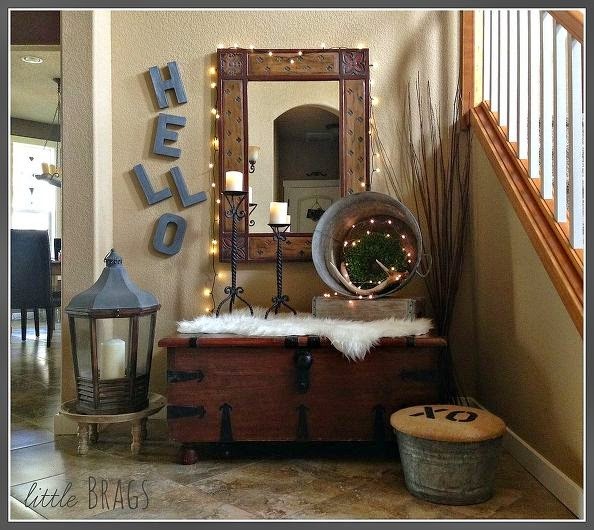 I love the "junk-inspired" new look in your foyer...it's perfect! Great use of the cardboard letters from JoAnn's. Glad you are getting some good weather there; we're still covered in way too much snow here in the Northeast. First visit to your blog and will be back! Love your eclectic foyer. It's unique and so creative. Is that a deer antler in the tub? It looks similar to one I found at our home's construction site this week, except yours looks bigger and has more points. We had nice weather for days and days here in NE Oregon, however it's snowing today. It's okay, though. It's supposed to warm up after today. This looks great! I love the letters spelling hello! 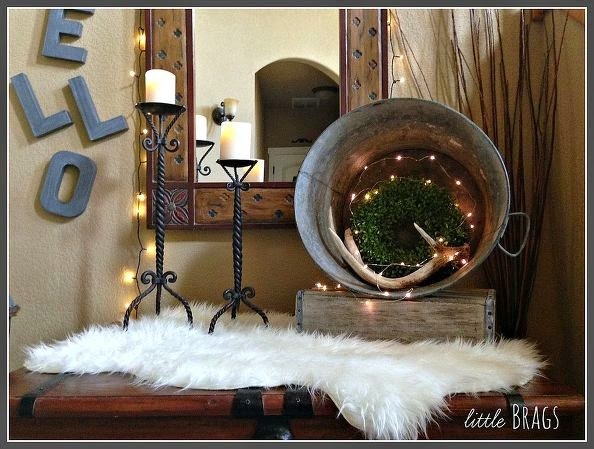 Lovely wintery eclectic vignette to greet your visitors! Those cardboard letters look amazing and I love the twinkling lights. Thanks for linking up to The Creative Circle. Hope to see you next week! Very Charming!! Visiting today from Sunday Features! That is BEAUTIFUL! All of the pieces play off of each other so nicely! pinned and shared! thanks for linking up at Totally Terrific Tuesday! I hope you make it back tonight at 10pm! Such a lovely creation! I love it! 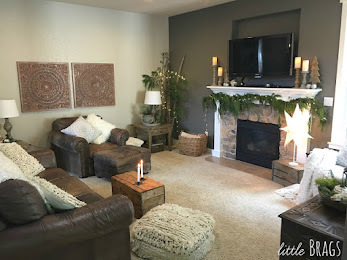 Visiting from Friday Feature Link Party! Thank you for sharing! I love this! Those HELLO letters are just perfect! Thanks so much for sharing with us at Talented Tuesdays. I hope you join us again tomorrow. Love this eclectic spot. 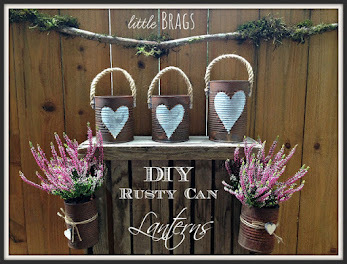 Those galvanized buckets are perfection. Thanks for sharing with the Pretty Preppy Party! Hi Christine! I had not seen this post until today. I am waaay behind on my bloggy reading! But I love what you did in your entry! I especially like the Hello and the old wash tub with the wreath and antlers in it. Your eclectic entryway looks anything but eclectic! It all comes together so well. I'm sharing this as one of my favorites tomorrow at Your Turn to Shine. Thanks so much for sharing it with us, Christine! Love these HELLO letters! They look gorgeous and I thought that they are made from some kind of metal :) the bucket is awesome too. What a genius way to make the letters get the metal look! I like this eclectic and rustic style. Love those painted letters and all your creativity. Thanks so much for sharing at Vintage Inspiration Party. Love it. So happy looking. Oh, I absolutely love your entry! What a beautiful entryway! 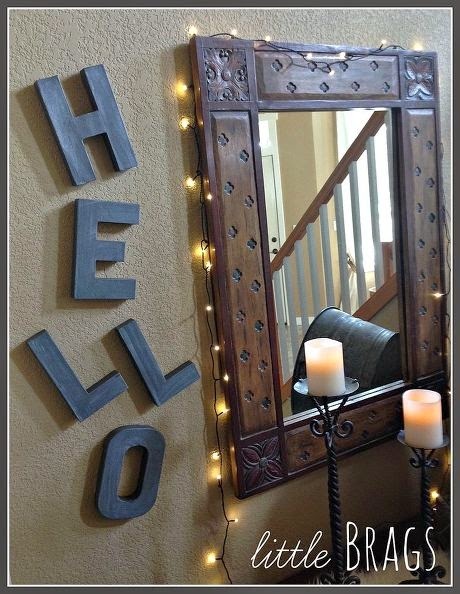 Love the whimsical "hello" on the wall!